* Dit is het aanbod van Aurelia, Exemplar of Justice uit Guilds of Ravnica. Als een kaart in meerdere series zit kun je die apart aanklikken hierboven. Klik op de getallen om direct naar iemands collectie te gaan. De leden die het meest recent zijn ingelogd staan bovenaan. Leden die meer dan 14 dagen niet zijn ingelogd worden niet vermeld. Aurelia’s last ability resolves before attackers are chosen. The target creature gains trample and vigilance if it’s both red and white. It gets +2/+0 only once, even if it’s both red and white, and even if it’s neither red nor white. Once Aurelia’s last ability has resolved, the creature keeps whatever bonuses it got from that ability even if its colors change. Mentor compares the power of the creature with mentor with that of the target creature at two different times: once as the triggered ability is put onto the stack, and once as the triggered ability resolves. If you wish to raise a creature’s power so its mentor ability can target a bigger creature, the last chance you have to do so is during the beginning of combat step. If the target creature’s power is no longer less than the attacking creature’s power as the ability resolves, mentor doesn’t add a +1/+1 counter. For example, if two 3/3 creatures with mentor attack and both mentor triggers target the same 2/2 creature, the first to resolve puts a +1/+1 counter on it and the second does nothing. If the creature with mentor leaves the battlefield with mentor on the stack, use its power as that creature last existed on the battlefield to determine whether the target creature has less power. 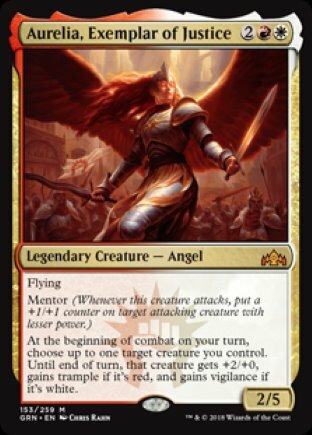 We hebben alle decks op de site voor je doorzocht en gekeken welke 20 kaarten het meest met Aurelia, Exemplar of Justice samen worden gespeeld.